The most popular of the Chinese New Year crafts is the upside-down character of "Fu." "Fu" in Chinese means luck, happiness, and prosperity. When it is upside down, it means "coming." This craft is used to mean that luck, happiness, and prosperity will arrive in the future. The "Fu" is usually written on a diamond shaped piece of paper with a red background. People normally post the "Fu" on their front doors or on living room walls. Dui Lian is also referred to as an "antithetical couplet." It is a pair of lines of poetry, usually hand written on red paper and posted on the front door. The two lines must have matching metrical length, and some properties of each pair of characters, such as meaning and tone, must correspond to be considered a Dui Lian. The ideal Dui Lian has few words, but deep meaning. For this reason, they use one character per word, as in Classical Chinese. The type of lantern used in Chinese New Year is usually decorated with a red paper shell. Some lanterns have candles inside for illumination. Most are made with red paper and are intended only as decorations. During Chinese New Year celebrations, the lantern is usually hung on the front door, or inside the house. In some parts of China, the lantern is a must for the Yuan Xiao festival (15th of the first month of the traditional Chinese calendar, also known as Lantern Festival). 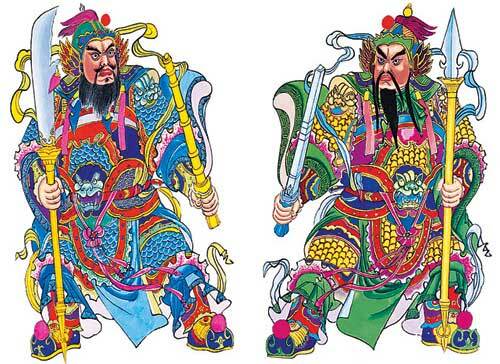 Nianhua, literally "Year Paint" is a large hand drawn painting specifically used as a decoration during Chinese New Year. Usually, it is at least 3 by 3 feet in size. Normally, the "Year Paint" is hung in the most prominent part of the living room. The most popular subjects include mountains, tigers, long living gods, and children, among others. Papercutting is an art form that involves cutting (usually red) paper. 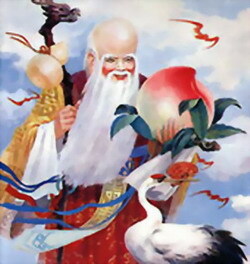 The most popular subjects are animals, humans, flowers, or the character of "Xi," which means happiness. 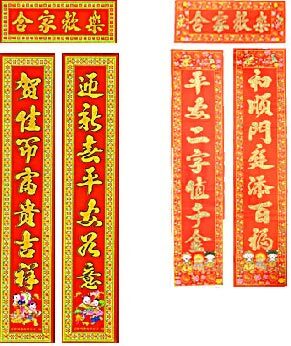 During Chinese New Year, most papercutting pieces are posted on windows, but some are placed on the wall or the front door. A door god is a Chinese decoration placed on each side of an entry to a temple, home, business, or other location, as it is believed to prevent evil from entering.